Each spring, during Easter week we deliver baby baskets to young mothers with little or no support. Our small laundry baskets are filled with gifts for mother and baby; layette for the newborn baby, diapers, stuffed animal, blanket, and little socks and cap, and for the new mother--handmade baby book (calendar, baby’s developmental stages, places for writing milestones and doctor appointments), prayer book, journal, coffee mug. 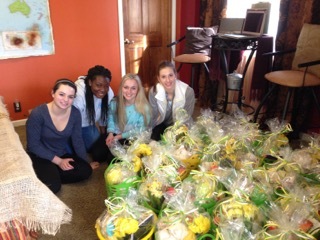 The baskets are assembled and delivered to shelters by volunteers. This year’s baskets will also be sent to the Houston area for mothers in urgent need.